China's not the problem with carbon emissions. We are. China’s Not the Problem With Carbon Emissions. We Are. 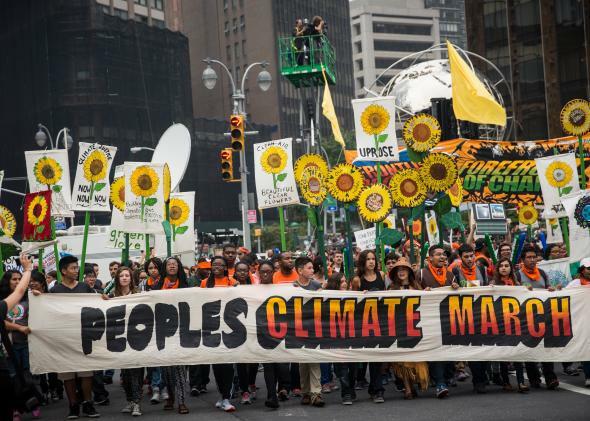 People protest for greater action against climate change during the People’s Climate March on Sept. 21, 2014, in New York City. We are all familiar with this hard truth: The world is barreling full-speed toward a fundamentally different climate, and we’re the ones responsible. Not we as in the royal we—humanity, civilization, the West, or whatever—but actually we: you and me. We, as in, you, the one reading this article; and me, the one writing it. The seemingly good news is that U.S. emissions have likely already peaked. Not so for China, where total emissions have doubled just in the last 10 years. But that’s missing the point. In the run-up to the U.N. climate summit in New York last week came a story that seemed to resonate with our continued inability to take meaningful action on global warming: For the first time China’s carbon emissions have passed those of Europe, on a per-capita basis. If that’s true, then those of us in the West are already doing as much as we can. We can hold up signs for a few hours on the streets of Manhattan, but when we hop back into our Priuses, we can rest easy knowing our responsibility for the problem is increasingly minimal. The average person in China (very different from China’s per capita emissions, which factors in things like factories that make goods for export) has a lifestyle that consumes far less carbon than the average American or European. In fact, it’s not even close. One theory on the root cause of the recent plateau in U.S. emissions, besides the rise of fracking and America’s associated domestic oil and natural gas boom offsetting comparatively dirtier coal, is that we’re exporting our coal to places like the United Kingdom, the Netherlands, Brazil, and China. But the climate doesn’t care which country the extra carbon dioxide comes from. On the basis of lifestyle, despite our recent apparent improvements, nobody burns carbon like the good ol’ US of A.
I reached Kevin Anderson by phone on Monday. Anderson’s research shows that, without a radical carbon diet by the world’s wealthiest on the order of 10 percent per year starting immediately, there’s little hope to preserve a safe climate. I tried to write this post without sounding pejorative or judge-y, because my intention is not to shame. But the fact is, if you agree with scientists that individual actions matter and there’s only a finite amount of carbon that can be emitted, every little bit counts. As much as I hate to admit it, that means those of us that emit more carbon than the global average are part of the problem. For perspective, the 99th percentile of global annual income is shockingly low: roughly $33,000 per year. Most families making less than that probably don’t live a lifestyle that’s fundamentally at odds with a stable climate. Those of us who make more than that should start to think about ways in which we can adapt to a carbon-constrained future. The debate over how to do this has focused almost exclusively on the rise of renewable energy, carbon capture, and other technological fixes that, in an ideal world, would contribute to a so-called deep decarbonization pathway on the macro scale. What’s rarely discussed is the role individual lifestyles play in bringing about the necessary sharp drop in emissions over the next few years. A carbon tax on individuals—not just businesses—could be the fairest way to do this, and would discourage carbon-heavy consumptive patterns while rewarding people that live within their planetary means. The atmosphere is going through an unprecedented rate of change, at least in human history, and quite likely for millions of years beforehand. Why then, should we not expect an unprecedented rate of societal change necessary to stop it? In his speech at the United Nations last week, President Obama said “we have to do more” to reduce our country’s emissions. Americans should start by taking a long hard look in the mirror.